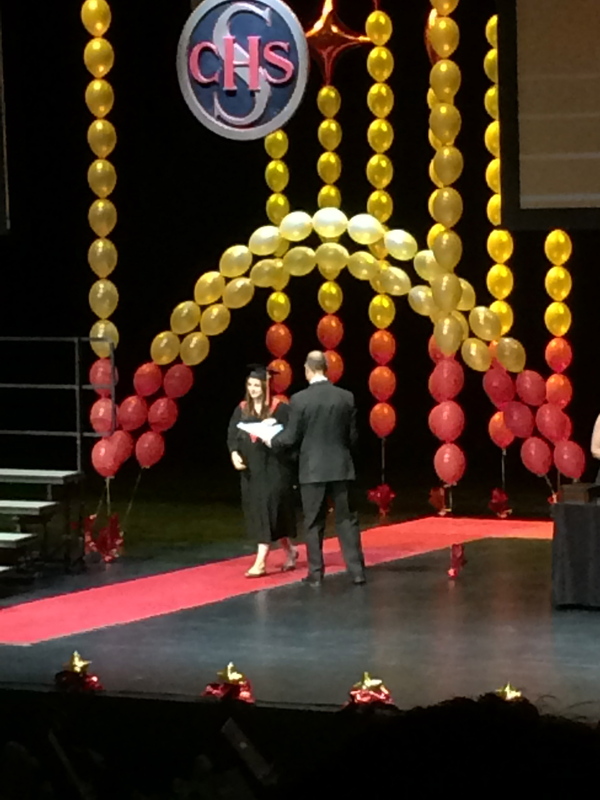 Ella walking across the stage at Scona’s commencement ceremony. There were 482 students at my daughter Ella’s commencement ceremony two weeks ago. Each one of them walked across the stage, accepted their certificate and shook hands with the principal. There was polite clapping for each of the graduates, until a young man appeared on the stage. Then, students in the audience went wild – yelling, hooting and applauding thunderously. I’ve asked Ella where the kids who have special needs are at her school. She said there’s a special class, but that some kids took classes along with the typical students. Ryan was one of the kids who was included in the regular classroom. I wept at the audience’s response to Ryan. The power of that graduating class was clearly behind him. I thought about all the people who had helped Ryan achieve his diploma along the way: his family, teachers, leadership, community, friends, and, of course, Ryan himself, with his own will and determination. The next night was the graduation banquet. It was a combination of speeches and entertainment. We were surrounded by twinkly lights, beautiful girls in their sparkly gowns and their handsome suitors. It was a sight to behold. Halfway through the program, Ryan got up to speak. He had his speech written out, and carefully read it to the crowd of close to 2,000 people. I marvelled at his bravery in presenting to such a huge audience. He talked about his time in high school, swimming at a local pool, and taking our LRT subway system (obviously a passion of his, as evidenced by this article here). Then Ryan’s dad Rob got up to talk. Ryan remained on the stage, catching glimpses at the massive audience. Rob thanked the high school and the students for believing in his son. He shared a story about how scared he and his wife were when Ryan came from junior high, thinking their boy would have no friends in the large high school. He talked about inviting kids to their house, and being terrified that nobody would show up. But two boys did show up, and they became Ryan’s friends. The crowd erupted into a chant of “LRT, LRT” for Ryan. I dissolved into heaving sobs. I had my face pressed into my husband’s back, and I could feel him crying too. To top off the evening, our mayor got up and promised to invite Ryan as his special guest to the opening of the new LRT station later this year. By then, I was messily wadding up tissues and had cried off all my make-up. What do we want for our children? We want them to have friends. We want them to be loved. We want them to belong. Ryan found that at Strathcona High School. My boy Aaron is just in Grade 5, and struggles mightily in school. Ryan and his dad gave me hope for Aaron’s future, and for that I am very grateful. Life for Aaron at school is not easy. There are many trips to the principal’s office. He struggles to keep up. He is often left behind. I get emotional in school meetings. And I’ve heard that middle school is even harder. But we all have to be strong and stick it out. When Aaron graduates in seven years, we will have a huge party to celebrate. We will invite all the people who supported him through school: his old Assistant Principal, his current Assistant Principal, his teachers, his Educational Assistants, the staff from the school office, and hopefully the friends he’s made along the way. We will invite every single person who believed in him, and knew that he could learn and succeed. We will celebrate Aaron for his perseverance, for he has to try so much harder at things that come easily to you and me. Book your calendars for May 2021. It promises to be the party of the century.